The CKA Canadian News is community driven news resource. Each day members submit links to news articles from around the web. We now get so many links that I have had to limit the news that appears on the homepage. When a new link is submitted it will show on the homepage for 3 hours, after 3 hours if the link has not received more than 15 visits it is considered "unpopular" and is dropped from the homepage. Unpopular links can be viewed on a seperate page, a link can become re-gain homepage status if it gets more than 10 hits. Links with a maple leaf are Canadian in some way, and are the prefered type for submission. Links are categorized, you can see what category a link falls under and clicking the category name you can view only news under that specific category. Placeing your mouse cursor over a News Link Title, will reveal a hovering box with more details about that link. The date and time it was posted, the member who posted it and the URL of the link. Clicking the link title will open a new window displaying the news link. There is a CKA column on the left-hand side of this new window, with the link details and any comments about the news item. A great aspect of the CKA News links is the ability to comment on news stories, to start active discussions. The commenting system uses the CKA forums, when you make a comment on a news link, its actualy making a post in the forums for you, so your forum post count will go up! You can also view the comments/discussion in the Current Events forum. If you are the first one to comment on a news link, the trusty CKA NEWSBOT will create the topic in the forums that the comments for that link will go under. The Newsbot is always trying to steal credit for peoples posts!!! 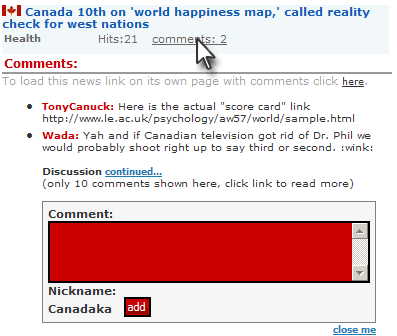 Under each link title is a "comment" link, clicking this link will reveal a drop-down box displaying upto 10 existing comments and a field.box to post your own comment. Since you don't have to load a new page, this makes commenting very fast and easy, you don'r have to leave the homepage, and can comment on as many news links as you want. As mentioned before, clicking a news link title, opens the link in a new window. 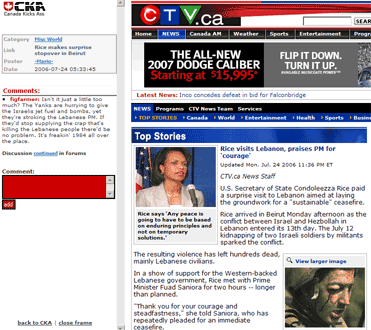 On the left-hand side of this window is a CKA Frame, where up to 10 comments are displayed along with a box to quickly leave a comment of your own while viewing the actualo news article. As mentioned above, commenting is actualy making posts in the current events forum, you can view this forum and read the active discussions and add to them from the forums. Submitting news links is super easy and fast! 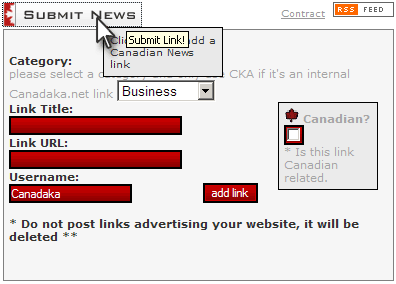 Near the top on any of the news links listing pages, including the CKA homepage, there is a "Submit News" button. Clicking this will reveal a drop-down box with a quick-easy form to add a link. Since CKA is a Canadian content site, we highly encourage quality Canadian related news and articles, it is the focus of the site.